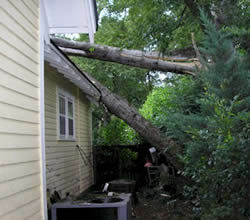 Severe Storms Came Through Charlotte Last Night | Have You Checked For Any Damage? Severe storms rolled into Charlotte again last night and with storms, comes power outages, lightning strikes, downed tree limbs and debris. It’s very important to not only check around your home for any items in need of repair, but you should also check your air conditioning system for any damage that might have occurred. According to WBTV Weathercast, there are more chances for isolated thunderstorms and damaging winds tonight, so you should check for any hail, flooding or lightning problems now. There could be a small problem that can be checked out by a Charlotte HVAC technician today, so that you won’t risk a complete failure of your system tomorrow. Another reason you want to have things checked out now is in the event there is major damage to your home or hvac system, you can contact your insurance company to find out if the repair of these items will be covered. In the mean time, check out our article, “Importance of Checking HVAC System After Storms“, for helpful tips on how you can do some damage checks on your own, and what steps you should take next if you do find things that need to be repaired. Did you have damage to your HVAC system during last nights storm? Leave a comment and share your story!